Integrated Aware thinking and Feeling - Welcoming growth and change. Growing my Self Awareness increases Self Empowerment. Being authentic is more important than working on my old power and control issues. Integrating all my Self Awareness systems - Emotional Age and Emotional Intelligence are both growing together. Seeing reality even more clearly. Combining feelings with reasoning gives a more balanced view. Problem solving is getting better. Less emotional pain. Realising at last that controlling others doesn’t help me feel better inside or fix anything inside me. Less interest in power and control issues. I am starting to feel good enough inside. 2. Print several copies of the empty Wheel . It’s better to print more than one sheet because you will find you want to rewrite the Wheel quite often. 3. On your first EA sheet, start writing a few short phrases in your own words that reflect the way you are feeling at the moment or the emotional tools that you feel you have been using recently. 4. Place each “feeling” or emotional tool inside or around the Wheel in the spot where you feel it fits best for YOU just now, just during the past hour, just for today or just recently. 5. The words on the sheet are only examples to help you get the idea. Some of the words will ring a bell for you. Some won’t. Keep the ones that apply for you, even occasionally, but we suggest you cross out any that you feel just don’t apply for you at any time, today or any other day. 6. Add more of your own words and feelings as you go. 7. Decide for yourself where you locate your descriptions based on your own feelings. Do not try to put the words in places that you think other people would want you to, or the places they would approve of. 8. After a while look at the sectors on the Wheel where you have placed most of your words, your thoughts, your feelings, your emotions on this sheet or which sectors of the Wheel hold the most energy for you on this sheet That’s your emotional age reading for now, or perhaps just your last hour, perhaps just for today. 9. Tomorrow will be different , so you will need to start a new sheet tomorrow. WHAT IS YOUR Wheel TELLING YOU ABOUT TODAY? More in the rest of your PYRO Zone? More IN your STAR Zone? More In your WING Zone? If your emotional age today is more to the right hand side than the left that’s OK. But do you feel you get stuck there and want to be able to move? It may be time to read some more and then talk to someone about how you can move yourself over a bit more to the self-aware, blue or A side on the left. There are lots of ways you can do this . The more I can think rationally and analyse the issues and see things from two or more different points of view the better I feel I am at solving my problems. The more I think through a problem rationally the stronger I feel and the less my emotional pain. However, somehow I still can’t fix everything. I know I am “good enough” but deep down inside I sometimes still feel “not good enough”. It seems to me that there are some things that rational thinking cannot get to. TYPICALLY THESE THOUGHTS and FEELINGS MIGHT APPEAR ON THE Young Fixer sector LOWER RIGHT (Yellow) Young Fixers are powerful but may over-react in a “young” way by not seeing things clearly. Examples: Trying to get other people around me to change. Exaggerating or distorting an issue. Criticising, generalising, stereotyping, judging or looking for flaws in other people. Projecting too much “I am sure” when reality is more “I am not sure”. Young Fixers feel stronger but their problem solving approach still displays strong young protector elements. Not able to look at issues clearly from both sides. Still seeing too many solutions as “”outside of me” or requiring others to do most of the fixing. Examples: Trying too hard to get other people around me to change. Arguing, Exaggerating or distorting an issue. It’s all too much too small, too tired, too vulnerable, too easily hurt, fearful, helpless, hopeless. No tools, no solutions, no way out. Lost or abandoned. I am just not good enough; I’m not lovable; I can’t make it work, I’m always wrong; I’m un-balanced, I have no value, I am powerless. It’s all my fault. I am too small, too tired, too vulnerable, too easily hurt, fearful, helpless, hopeless. I keep doing things again and again to get others to like or love me: Being extra charming towards others. Being overly compliant, don’t rock the boat, keep the peace. Giving in; Running away, or playing the undeserving victim to gain sympathy. TYPICALLY THESE THOUGHTS and FEELINGS MIGHT APPEAR ON THE Young Fighter-Survivor sector - Young Fighters are powerful but may over-react in a “young” way by not seeing things clearly. Arguing, Resisting, Blaming, Rebelling. Trying to undo the losses that we sustained by playing the needy child roles for too long. You might choose to use this Wheel to help others see where they are at any one time. BUT you must never use the Wheel to put another person down, or judge them or suggest what they are doing is “wrong” or that they are being “childish”. If you did so you would be using a very un-grown-up emotional tool yourself. There are times each day when every position except perhaps “pink” may be just right for you at that moment. E-mail me bligh3@growingaware.com I will send it to you as a pdf file by return e-mail. Sorry, it cannot be downloaded. I march to the beat of my own drum. I'm no longer bound by other people’s rules. I can change and adapt because I'm flexible and have the power to make my own choices. “I choose to ....” “I have these options.”; “First I think the plan out. Then I put it into action. I make it work, I get it done, the way I wanted. “I can learn new and better ways to fix things. “I'm free to choose. Feeling much stronger. Rational mind is now able to share the work. These parts work better by looking at problems then reasoning, analysing and arguing but often with an eye to winning rather than resolving the problem. Moving into the green zone is a big step forward. At this point you can start to notice your Emotional Age growing and you begin feeling more confident. Your rational mind would now be able to help look at issues from both sides, then reason, analyse and resolve them, but not always with a mature outlook. 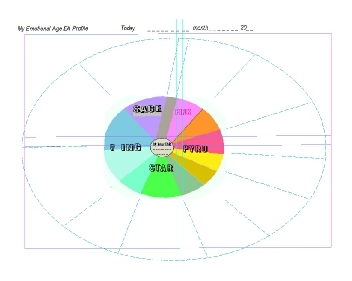 For a start you might like to read the Emotional age case study - Case Study A click here- to see how “Dell” uses her Emotional Age Wheel to help her deal with a difficult situation. The first run has sold out already but more are on the way. Special introductory price $19.95 USD including postage to your address anywhere in the World.